For the record, I disagree with so many experts who insist on detailed and thorough business plan market research for every plan. I vote for a lean business plan that includes only what you are going to use. And a lot of us know the market already, so we don’t have time, resources, or budget to do market research for our normal planning process. I make this point here in my latest book on Lean Business Planning. However, I do also suggest taking the “fresh look” at the market at least once a year. Existing businesses that want to grow too often skip the part of business planning that requires looking well at your market, why people buy, who competes against you, what else you might do, what your customers think about you. Think of the artist squinting to get a better view of the landscape. Step back from the business and take a new look. Use the standard Know Your Market techniques and content, just applying it to your business, not a new opportunity. For creativity’s sake, think about revising your market segmentation, creating a new segmentation. If for example you’ve divided by size of business, divide by region or type of business or type of decision process. Aim for strategic segmentation. Here’s another great example of why you don’t blindly trust research. This illustration comes from this Gizmodo post. Post author Jesus Diaz is not saying this means what it seems to say (see his conclusion below). But here you are with another example of how easy it is to get the wrong conclusions, especially when the research is summarized to easy conclusions. Gizmodo author Jesus Diaz doesn’t say where this data comes from, nor does he define the terms, which is fine with me because the data makes the point. p.s. If you take this seriously, you are an idiot and you should go stick your head up some dark hole. I grew up believing that facts, like research, numbers and percentages, told the truth. I believed in objective, verifiable truth, based on fact. I distinguished that from mystical religious truth, based on faith. I was a mainstream journalist for almost 10 years in the 1970s. Every professional journalist believed in objective verifiable truth based on fact. That was the goal of reporting. We separated subjective opinion from objective truth. Truth was hard to find, yes. It often had to be dug up and uncovered. But it was there. Truth is not research and data. Although my generation grew up believing hard numbers were truth, it just isn’t so. Nowadays there is data to prove anything, regardless of how absurd. And people routinely hide their opinions as data. Eggs are good? There’s data to prove it. No, eggs are bad? There’s data to prove that too. The same for coffee, sugar, exercise, structure, discipline, whatever. The truth is not in the data. Truth is a believable story. And much of human truth is better told in stories than a facts, and much less numbers. And in business, Seth Godin says marketing is stories. I say planning is stories. Truth isn’t what the research says, or the focus group, or the latest survey. Take a step back from it and ask, always: Does this make sense? Is this credible? All human beings have an innate need to hear and tell stories and to have a story to live by…religion, whatever else it has done, has provided one of the main ways of meeting this abiding need. I don’t mean it as disrespectful to see the “story” to religious doctrine. On the contrary: The right stories, real stories, the best stories communicate truth better than so-called facts. And it’s almost a proof of God how themes and meanings overlaps between the different stories of the different religions. Maybe there is a good gene, in our species DNA. And the stories are an expression of how humans all struggle to understand God, or creation, or whatever that immensity is, in their own way. With their own background and culture. My summary: truth is a believable story. 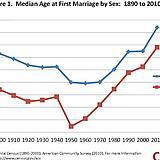 I’m intrigued with the way the marriage age dropped suddenly after the second world war, then increased steadily for several decades. And is still increasing today. I like it when actual data matches what we see in the real world, and we definitely see people waiting to marry at more advanced ages. Sometimes this kind of data generates business ideas, business opportunities, or business threats. Does it affect your business? This is something like an economic world map, nicely done, by International Business Guide. Reproduced here with permission. data from your customers is always better than your best intuition. Wait, what? Did he really say that? It’s not the customers’ job to know what they want. Paul Brown tells a story of a mouse pad combined with paper that he thought was a great idea, he bought, he used, and he didn’t like. He suggests that asking customers would have been better than guessing. Talking to customers, sure; great. Data from customers? Not so much. My problem is that so-called “data from customers” is rarely truth. Data gathering is plagued with problems of research design, random lists, skewed questions, half truth and innuendo disguised as data. If it were really good data, the real result of actually talking to customers, that would be pretty good. But seriously, how often are customer polls and primary research really valid? Seldom. And ironically, his story argues for using the darn thing, not polling potential customers. He says he liked the idea until he actually used it. I think that’s a clue. No? My career has been software, and I can tell you this: The best software comes from people who use what they create. Not from customer data. The problem with thinking like this is that then data ends discussion and trumps common sense. Which would be okay, most of the time, if so-called data were truth. But it rarely is.